Friday Feast covers some diverse foodie topics and thanks to best-selling Australian rural romance author Fiona Palmer this week is no exception. It’s always a delight to deal with Fiona. She’s not only a fantastic author, whose stories are adored across the nation, she’s a genuinely warm and friendly country person and I’m very much looking forward to reading her new book, The Sunburnt Country. Jonelle Baxter is a young woman in a man’s world – a tough, hardworking motor mechanic from an idyllic country family. But lately things in her perfect life have been changing, and her workshop isn’t the only local business that’s struggling. Daniel Tyler is new in town, posted from the city to manage the community bank. As he tries to rein in the spiralling debts of Bundara, he uncovers all sorts of personal dramas and challenges. The last thing Jonny and Dan need is an unwanted attraction to each other. She has enough problems just keeping her livelihood going and he’s fighting pressures that stretch all the way to Perth. It’s going to take more than a good drop of rain to break the drought and bring change in love and in life. A moving and heartwarming story about the beauty that’s found in the bush, especially in the most trying of times. Doesn’t that sound fabulous? How cool to have a mechanic heroine, and one who races too. The Sunburnt Country released last week, and you can buy a copy right now from your local bookshop or chainstore, or, if you like delivered to your door (or ebook reader!) convenience, try home-grown online bookstore BOOKTOPIA. They’re hugely supportive of Australian authors, have competitive pricing and run an easy to use website. Plus they were Platinum Sponsor of last weekend’s Australian Romance Readers Convention, so I’m feeling the luuuurve. Perhaps you should too! Ooh, Fiona has a booktrailer. A good one. Wanna watch? Just click play. Then, once you’ve been all relaxed by that lovely music, let Fiona reveal a tasty favourite. I’m not the greatest cook and therefore don’t have many favourite dishes. But today I thought I’d tell you about a meal that comes up in my new book The Sunburnt Country. Actually this dish probably features in a few of my books because it is something I did lots as a kid and even to this day we still walk to the dam with our kids to catch them. 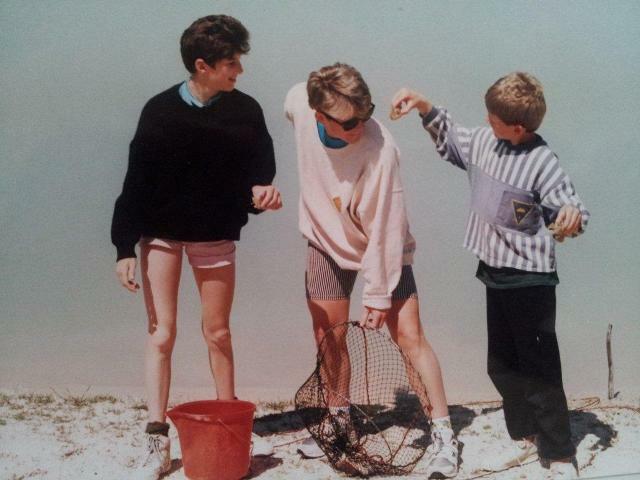 I’m talking about Gilgies or Yabbies. We have always grown up calling them Gilgies. Identifying Freshwater Crayfish, Fisheries Fact Sheet, Department of Fisheries, Government of Western Australia. At the moment we are trying to feed up the Gilgies in the dam just on the edge of town. The kids love walking through the bush to get to the dam when we throw in some nets. 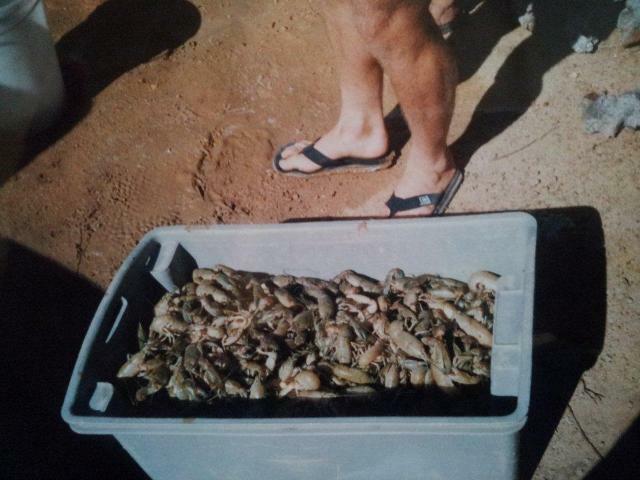 Then a few hours later we pull them in and take our yummy freshwater crayfish home to cook. We have a pot outside on a gas burner, which we fill with water and get it to boiling temp. Chuck in some garlic and chilli to flavour the water and then drop in the Gilgies. The next is pulling the heads off and peeling the tails. My 8 year old son loves the Gilgie meat and if you don’t get in and eat some then chances are you’ll miss out. We also keep the big claws are these are delish also. We eat ours just on their own dipped into a simple sauce. (Hubby loves a Gilgie sandwich!) The sauce is mayonnaise, with a bit of Worcestershire sauce and tomato sauce. Each time I make it, it’s slightly different as I just add the sauces until I like the taste. 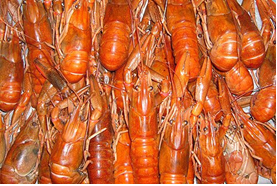 But if you want to get more creative with your yabbie meat check out these yabbie recipes from Cambinata Yabbies. It is a family run business on a farm not far from us. Thanks so much, Fiona. That was fabulous, especially those photos. Sigh. I LOVE yabbies. They’re one of my favourite things and I really don’t understand why we don’t see more of them on menus. The Crown Hotel in Wentworth, NSW, has the right idea. You can buy yabbies by the bucket (when available) and they serve a delicious yabbie chowder. Wentworth has a lot of Australian history but I swear it’s worth a visit just for that chowder! So, special Feasty Folk, what’s your favourite crustacean dipping sauce? I’m a huge fan of Vietnamese nuoc cham sauce. The freshness and heat seem to work perfectly, but I can just as easily munch prawn tails dipped in old-fashioned thousand island dressing, and I recently tried a delicious paprika and lemon baste for grilled prawns that became an instant keeper recipe. One can never have enough ideas though, so share away! This entry was posted in Friday Feast and tagged Australian Romance Readers Convention, Booktopia, Cambinata Yabbies, Cathryn Hein, Crown Hotel Wentworth, Fiona Palmer, Freshwater Crayfish, Gilgie, Gilgies, promo, romance authors, rural romance, rural romance authors, The Sunburnt Country, Yabbies, Yabby on March 8, 2013 by cathrynhein.